In a wide-ranging interview with the German weekly Die Zeit that will be published on March 9, Pope Francis briefly discussed the idea of allowing the ordination of married men to the Catholic priesthood. Describing the vocation crisis as an “enormous problem,” Pope Francis suggested he sympathizes with Catholics who come to Mass only to discover that there is no priest available to celebrate the Eucharist. “This weakens the church because a church without the Eucharist has no strength,” he told Die Zeit. The term viri probati comes from the Latin viri, meaning "men," and probati, for "proven" or "tested." It is an expression that has been raised in previous discussions of the possibility of a married Latin Rite priesthood and is used to refer to married men of strong faith and impeccable virtue. The pope also returned to regular themes, lamenting unemployment in Europe as a “huge problem”—especially among the young—and worrying over the continent’s low birth rate and the treatment of refugees. He looked forward to the results of a papal commission on the history of women deacons. He noted that a Syrian theologian had once explained that “the question is not whether there were consecrated women or not but what they were doing.” He suggested that he was awaiting more information on the issue after the commission meets again this month. Why does the Catholic Church require most of its priests to be celibate, and is this going to change? He called for prayer and a recommitment to service to others as a means of responding to the declining vitality of the church throughout Europe. Correction (March 9, 11:38 a.m): The original version of this article suggested that a "Syrian professor" was serving or advising the Vatican commission for the study of the female diaconate. That was an erroneous read of the content of the Die Zeit interview. There is no such person on the commission. Pope Francis has previously mentioned this insight on the historical record regarding women deacons from an unnamed Syrian theologian. It is long past the time to get on with regularizing the ordination of married priests. In the diocese in which I live, the number of retired priests outnumber the active priests. The most important points to discuss: Is the Eucharist important enough to make sure, as far a humanly possible, that there are enough priests to celebrate the Eucharist in our communities. If that is the case, secondly, we want those candidates to have the faith, the maturity, the strong calling to the priesthood. So: All those called with the required faith and maturity should be eligible for ordination. This group would and should not be limited to gender and marital status. Forgive me if I am wrong , and I want to stand corrected, but it is my belief that the "course" requirements for the priesthood involve a study of 5 years' duration. Perhaps one alternative might be a reduction in the amount of the "time" it takes with appropriate consideration of life and career experience and other academic qualifications. And a highering of the "age" requirement. Some inclined to late vocations might be put off by the prospect of another 5 years of "schooling". In our parish we have a word and communion service with the sacristan presiding every Monday morning. Also some other weekdays when the priest is absent. One holy day some years back, with a previous pastor, we had three women leading the service when father called in and said he was unavoidably detained and couldn't make it. In those cases, there wasn't much difference from mass, except for no sermon. The three women service was something special. Maybe we don't need priests for every worship. It's not the lack of a "sermon" but the lack of the Consecration of the bread and wine that makes the big difference. But why is celibacy required for either men or women? Clearly there is no theological demand for it in the Eastern church nor in accepting married former protestant clergy. That is not the point. The point is that Jesus was celibate by choice and, to image Christ, it is more significant to be celibate than to be male. In fact, the eternal Word was not a male before the incarnation; so, for the redemption, and the sacramental economy, the masculinity of Jesus is as incidental as the color of his eyes. So what if the Eastern choices are so patriarchal? The Church is "one, holy, catholic, and apostolic," but nor necessarily patriarchal. The "apostolic" mark of the Church is a matter of faith. The "patriarchal" limitation is NOT a matter of faith. Some of your comments are just not correct. You say women are not mentally as capable...then cite military introduction to combat arms where physical strength is the issue that washes out women seeking combat arms training. In some specialties in the military, women's enlistment or commissioning is limited by openings available. When women were first introduced to the Navy Chaplaincy, for example, the number of women who could enter the Chaplain Corps was limited by "sea-shore rotation"al limits. That women could not at that time be assigned to sea duty, by Navy regulation, not by women's capabilities, meant that the number of women who could serve was very limited so that they would not prevent male Chaplains who were coming off sea duty would have an opening on a shore facility for assignment. Too many women and the men would be stuck with consecutive sea duty assignments. That had nothing to do with physical or mental qualifications. It had to do with months and years. The same sort of issue is currently involved in women reporting for submarine duty. The billets are limited (there are more volunteers than the Navy can currently accept). As for sea duty in general, the numbers on each ship are going up...they are limited by berthing compartments...you cannot go from, say, 46 women aboard a ship to 47 or 48---you have to wait until you have another 18 women to send, because of the configuration of berthing compartments and which ones can be converted to a woman's berthing compartment without requiring watchstanders to go through berthing compartments of the other gender enroute to a duty posting. If you are reporting on the "mental" equivalency, I can tell you as a Navy officer of 20 years active duty experience...women in the service outshine men by intellectual capacity; they often had to convince their families so they are committed to this career field in a way that young men are not. For a young man, drifting into the military is a default option; for young women, parents are likely to be not so supportive. As far as , for example, seminary studies, Protestant seminarians of the denominations whose training is most like that of Roman Catholic seminarians, ie, Lutheran, Episcopal, Methodist, Presbyterian, etc., the percentage of women at seminary are more than 50%. (They were below 2% in the 1960s), so that is not a valid argument. In fact, in many academic fields, women prove to be more capable--women are oriented as a whole more vocally and print oriented; less so for men; who are much more likely to be physically active and prefer to learn through such active methods of study. Brian: I think you need to rethink your arguments. They need work. Brian, Ordinatio Sacerdotalis is NOT a dogmatic definition. It is an edict to temporarily stop discussion of the issue. It is "definitive" about the past and the present, but says NOTHING about what the Church can or cannot do in the future, so it cannot possibly be an infallible definition of revealed truth. Everything else you say is the familiar patriarchal narrative, but is not a matter of faith. I am Jesuit-formed (Fairfield Prep and U) and a priest for almost 40 years. I have a struggle with the logical inconsistencies about married men being allowed to function as priests: Eastern Rite = Yes, (former) Anglicans and Lutherans = Yes. Catholic men who were "probati" and ordained who in later years in conscience felt called to the vocation of marriage = NO! Did they somehow lose their "probati-ness"? When we Catholics speak of reconciliation as "making things right," why do we persist in having this blind spot?? If we claim that the life of the Church is founded on the Eucharist at its center ("source and summit"), WHY do we allow these inconsistencies to deprive the Eucharist to communities of the faithful??? Just how loudly must the Holy Spirit speak? Clearly we are woefully short of priests to tend to our Catholic families and enrich their communities with the fullness of the sacraments. Celibacy has long been the primary stumbling block to ordination. Time for Plan B. To see an example of the gross shortage just look at Brazil with one priest to nearly 20,000 Catholics. Brian, what I see today is parishes with one old priest, or without a priest, and a Pope who admits that we have an enormous problem. Do you have any evidence of growing seminary attendance to support your optimism? Brian: One of the reasons for the decrease in vocations is simple: The size of families. For every family in about 1950, you may have had 5 kids--or more. Today, there are maybe 2-3 kids. With large families there are different, if unspoken, pressures on young men (and women) as they grew up. Assume a family of 6 kids--which was not uncommon in 1950. Out of those 6 kids, perhaps one went to seminary and one went into the convent...they were aunt and uncle to the kids of their siblings, and the family continued. As you get older, you may understand better the idea of "having grandkids"...ask the couples in their 60s and up, and they talk about hoping for grand kids. With 2 kids in the family, which it not all that uncommon today, first, there may BE no boys; therefore, no priests, and if there is one son, and he goes into the priesthood, the family line ends. It is not spoken openly, and many parents may deny that they discouraged their one or two sons to go into the priesthood. In addition, what choices did families have in the 1950s? There were fewer prestigious occupations that Catholics were welcome in; there was still some residual hostility and prejudice against, Irish, Italian and Polish, among others, which meant that the sons of these families had higher barriers to surmount to become an attorney, etc. Going into the priesthood was welcomed in a prestige way that it isn't today. Now, before everyone tells me that priests in the families are loved and a source of pride for the family, especially the parents, yes, that is true, but the atmosphere is different. A priest doesn't have the same level of prestige in the larger community (neither does Protestant clergy, for that matter...) that they had when priesthood represented the highest academic/intellectual attainment than today, when anyone can be anything. Back after the war, various groups "knew their place" and that is fading for all groups in the US. There is still racial prejudice, but for those who are white, it is truly "you can do anything you want". And when it is an only son....parents may have very mixed feelings. Brian, I don't agree with you when you assert that in a few years, the vocations problem won't exist. If that were true, those of us within the Archdiocese where you are also from would have heard about it from Cardinal Cupich, who is very up front regarding the need for vocations. Additionally, your final comments regarding married men not being able to really be a full spiritual father to the parish is just absurd. The argument could easily be placed into another context, such as having the priest choose between his mother and a parishioner. Give me a break. And I'll go one further. You would not ever want to put a man into that situation?? What about all the women who work at the many parishes within the Archdiocese who are regularly asked to sacrifice family time so that the work of the under-staffed parishes can be accomplished? I hope that, when you do enter the seminary, that you'll be afforded some time to actually work at a parish and become aware of these dynamics. There is no Syrian on the commission. I wonder who he is talking about. Thanks, a correction to the article has been issued. The pope has previously referred to this source; it's not clear to me at this time whom he is referring to. That wasn't much of a discussion, was it? The vocation crisis is "an enormous problem" and it's tough on Catholics who go to church and find there's no priest there. But "voluntary celibacy is not a solution". What to do? Well, wait for the Holy Spirit to give us a sign. Could any elected leader survive such an admission of helplessness and passivity in the face of disaster? There is disagreement among Catholic scholars, including canon lawyers, about whether the teaching that the Catholic church has no authority to ordain women to the priesthood is infallible. Two extremely learned articles on this question were published in the Dec. 9, 1995 issue of America. Ladislas Orsy (S. J. ), "The Congregation's Response: Its Authority and Meaning," and Father Francis A. Sullivan's "Guideposts from Catholic Tradition." Sullivan is widely considered a top authority on the theological understanding of infallibility. Orsy was a very distinguished canon lawyer. The issue shouldn't be the shortage of priests. The issue is the call to be ministers for the community and certainly married people can respond to that call. And that includes men and women. And I would further suggest that that call can come from within the community. Is it just me, or is it rather odd for the Pope to speak about such serious matters in, what appears at least, rather "Off the Cuff Remarks" ? I have known many Priests and some of them are desperately lonely. not easy. Sometime it is even harder if the other Priest in the Rectory is a very cold person. Perhaps that is the Cross the Priest is called to carry and endure, but I have seen it break priests in ways that appear quite un-healthy. As for the number of years of study for the Priesthood, it seems the mandate is four years in Theology/Seminary, not four years of study. You could complete all the studies in two years, if Summers were included and non-essentials were not demanded. Perhaps America should ask Deacon Owen Cummings of Mount Angel Seminary for his perspective. He is a married Deacon and has taught and known hundreds of priests. Yes Henry, it is quite odd, and quite dismaying. It is also odd that his two predecessors seemed equally uninterested in this horrific problem. This is the fallout from Church COVERUP of the truth regarding pedo-priests. The Church felt protecting reputation was more important than child safety. This is world-wide disgrace and has been going on for how long? I'm devastated by my church on this matter. No wonder this priests shortage is happening. Soon there will be no priests and no one in the pews. There are already empty pews. Most Sundays, I have a pew all to myself. As a child in the 1950's the worst thing we could do as children is not be ready on time which would invariably result in our family having to stand up in the aisle for Mass. One never sees standing room only anymore. I’ve said this before, but I like to identify myself as just an ordinary Catholic layman who knows a little about many things, but not very much about anything, a perfect fit! Realizing that nobody knows everything, I’d like to offer a segment of insight on married men as priests, hoping that additional insightful segments from others may complete the picture, so here goes. It’s like a community of people dying of thirst, near a Lake of sparkling drinking water because a sign at “Lake Priesthood” says, “Do not drink, celibates only!” I don’t see married priests as so revolutionary, considering that’s the way it was in the beginning. Jesus didn’t just choose celibates, out of twelve maybe just one, the young John. Maybe not, as Jesus placed his Mother, a woman probably about forty-three years old in his care, assuming she was about fifteen at the Annunciation. Obviously John had a home and maybe a wife as well. Or maybe it was the home of John’s parents, where his Mother could attend to Mary’s needs. A young man seems an inappropriate person to look after a middle age woman that Mary was at the time. A lot of conjecture here, maybe sheltering truth. This is not to say that the heroic charism of Celibacy should end. No, it should coexist side by side with Sacramental Christian Marriage, both Pentecostal Gifts of the Holy Spirit to the Church, with the Gift of Celibacy packaged in the special “for those who can” wrap, offered by Jesus. In other words, Celibacy, should be “chosen not just “accepted” and certainly not “mandated.” Truly the Church always provides, or as is sometimes said, “suffices.” Give the word and it shall be done, Holy Father Francis! But how? Well, maybe married men chosen from the Community by the Community to be their priests or however chosen, could be ordained in the Simplex Mode, “Mass Priests” as they were once called in certain Religious Orders. These men would celebrate Eucharist for the Faithful, administer the Sacraments and Preach, but “Faculties” as it’s called to hear Sacramental Confession would be withheld. Of course as validly ordained priests, they have the authority to forgive sin and in dire need may exercise that function. A useful idea? Bruce: I know what you are trying to say by describing yourself as an "ordinary layman". There is no such thing. You are extraordinary, you are immortal diamond, you are a child of God born of dignity and grace and your place is with Him for eternity. In no way should this be deemed "ordinary" when it is actually supernatural. My pastor weekly at every opportunity during Mass or outside of Mass hammers into us and teaches each one of us to look for and find the divinity in each other. I can feel the divinity in you. I hope you can feel it too. Andrew, thanks for your kind words, heritage to all who try to serve the Lord in sincerity and truth, not just me, you too. But I must admit I do see myself as "ordinary" as in "Ordinary" liturgical time, during which we get an in-depth understanding and appreciation of what it means to "live by Faith," a great way to live! Congratulate your Pastor for me, for his shared joy in ministry, high fiving his impressive zeal! Again thanks and let's pray for one another as we journey to our home among the stars! The topic of the ordination of married men has been a topic that has been debated to death in many past articles in Am. Mag. Both a male celibate and married priesthood can exist in our Church because its prohibition is not written in Scripture as divine law. Most of the Apostles were married men and Paul did not prohibit any of his disciplines from marrying. While he preferred that his disciplines practiced permanent continence, he also taught that if one cannot do it, they would be better off getting married rather than to burn in Hell. As for women priests, this teaching is based on a speculative interpretation of what Christ might have meant by making only adult men his Apostles. Keep in mind that in ancient times, women were not allowed to own property and their testimony in a court of law was highly untrustworthy at best. In essence, they were second class citizens. To whit, a woman preaching about the 'good news' as an Apostle would have had to overcome significant problems in reaching the minds and hearts of men in ancient times, much more than any of the male Apostles did. As for St. JP II's infallible proclamation that women cannot become ordained priests is highly controversial. Nevertheless, I agree that for various reasons a married priesthood will not happen in the near future, but a woman diaconate may soon become a reality, God Willing. The only topic missing from all the comments here is a determination of exactly how many angels fit on the head of a pin! We have a problem, a big problem. There are far too many Catholic communities throughout the world, including the USA, without the consistent presence of a priest, a priest who can offer Mass and consecrate the Eucharist, the central and most complete form of Catholic worship life. And like in so many other instances where the Eucharist is the center of the discussion, a debate about Church norms, regulations, and protocols winds up overshadowing the simple fact that large numbers of members of the Catholic Church are denied access to Eucharistic worship. Thank God, at least we have a Pope who recognizes the essential issue. How can we not be talking of women's ordination as the best means to address the priesthood shortage? That prohibition flies in the face of everything the Church teaches about the nature of God's love and our shared human dignity. Celibacy is a choice for men who are free to join the priesthood. There is no injustice in requiring that choice, or in eliminating it. 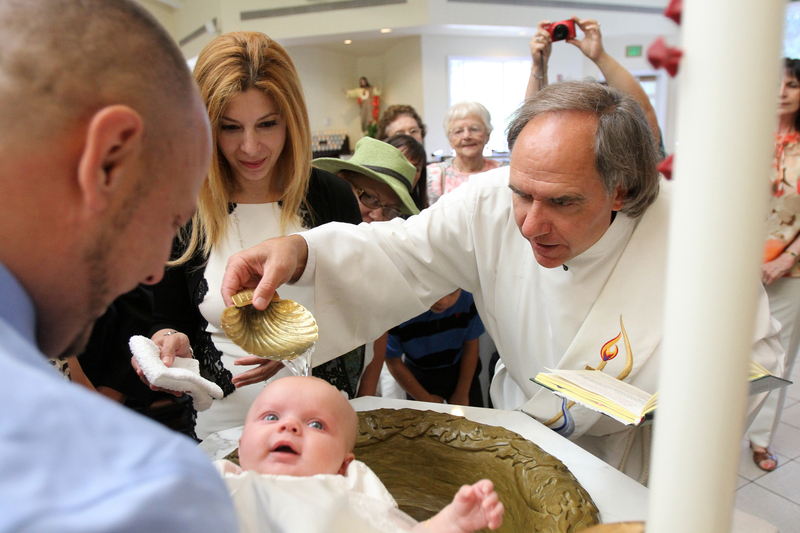 Priests with children to support and educate--with large Catholic families to be sure--will certainly be driven by different motivations than those who currently serve without those additional responsibilities. Celibacy should remain a free choice and the preferred one for the ordained Catholic priesthood. However, where is all the evidence that the Anglican married priests who are now Catholic priests are doing a less-than-effective job in carrying out their responsibilities? Also, can anyone truly say that all the other Christian Churches with married pastors are delivering less effective ministries compared to Catholic priests because they have families? I agree that the ultimate sacrifice is celibacy. However, when we have parishes with no priest then celibacy should not be an impediment to an ordained priesthood whether we are talking about men or women. However, I have no illusion that women will be admitted to the ordained priesthood in the near future for a host of reasons including political. Lastly, you said that women's ordination flies in the face of everything the Church teaches. Yes, but it does not necessarily fly in the face with God's Will because there is a solid evidence and a rationale that men were selected by Christ to be his Apostles because women were considered second class citizens and not trusted as leaders when it came to legal or spiritual matters of faith.